The Cleveland Browns are signaling they’re moving on from troubled quarterback Johnny Manziel. In a statement Tuesday, the Browns said that Manziel’s actions run counter to their expectations of players off the field and undermines the reputation of the organization. Manziel is under investigation for a possible assault involving his ex-girlfriend over the weekend in Texas. WKSU commentator Terry Pluto says that after a tumultuous two seasons, it looks like the Browns are finally saying they’ve had enough of Manziel. Terry Pluto says the latest incident over the weekend in Texas was the last straw. "When you have your quarterback being chased by police helicopters, you just kinda can't stand this anymore. There's been so many incidents: Johnny wearing a wig in Las Vegas, going by the name of Billy. [That was] the weekend that the Browns were ending the season. The weekend when he supposedly had a concussion and the last thing you do when you have a concussion is get on an airplane and fly across the country and go to a casino with a bunch of lights and things." And, Pluto says the new regime in place has little tolerance for Manziel's antics. 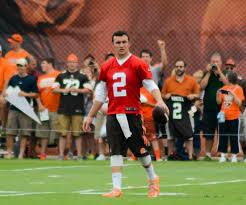 "The moment Hue Jackson became coach, I thought that was it for Johnny anyway. Most of the great coaches are tied to great quarterbacks. Bill Belichick and Tom Brady in New England. The greatest Browns coach ever, Paul Brown, had Otto Graham. The last winning Browns coach, Marty Schottenheimer had Bernie Kosar. Manziel "spent 10 weeks in rehab from last January through the spring. When he came out it became very clear within a few months that he either stopped going to his aftercare or his groups or he just didn't care. If you're Sashi Brown, the new vice president of football operations, and if you're Hue Jackson, the new coach, you're going to Jimmy Haslam, the owner, and saying, 'Enough. Two years of Johnny. These aren't dog years. These are like dinosaur years. It just feels like it went on forever.' And you can't win with him on top of it!" Pluto says setting aside Manziel's off-the-field antics, he never really was that impressed with his moves on the field. "Frankly, you could be unfair in sports and just say well if he's super talented, he gets more chances. That's one thing that always amazes me about the fans that constantly apologized for Johnny or the media people. He wasn't that good." "They can't officially cut him until March 9. Unless Johnny Manziel flunks an NFL drug test or something like that, even if he's cut on March 9, he's still guaranteed another $4.6 million. And that's on top the other like $4.5 million he's already made." Pluto says last week, veteran quarterback and teammate Josh McCown said he's been in contact with Manziel. "That's all he would say." Still, Pluto, who has been doing jail ministry for 16 years in Summit County, says Manziel has access to plenty of resources. "I wish my guys had 2 percent of the help available to Johnny Manziel. [He could have] A group. A personal counselor. Rehab. It's all open! [He has] The team; the players association. His family is rich oil people from Texas. "But the thing you learn early on when you're dealing with somebody who has addiction problems is they do what they want to do. And you can offer all these chances and you go back and look at it and maybe Johnny was somewhat sincere when he went into rehab before. But when he got out, I said, 'Now it's for real ... because you have more freedom. It's why I've seen the same guys come in and out of the Summit County Jail for years and years and years. Those are the guys without the safety net of Johnny Manziel. But Johnny's behavior isn't much different than that." "I think what the Browns wanted to do is send the message that he was undermining the integrity of the team and all the other players were hardworking and secondly, you get tired of that. And remember, we're not talking about a superstar. Now you can say it shouldn't be that way, but sports is a bottom-line business. And there were so many warning signs and most of it, frankly, lies right on the desk of owner Jimmy Haslam." Pluto says, once the team formally cuts ties with Manziel, the next focus is on finding the next quarterback. And, once again, "Here comes the draft." Pluto: Manziel makes strides, but can he handle the pressure of success?